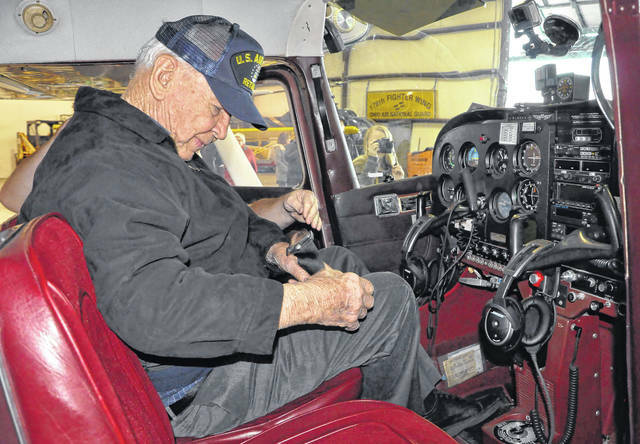 Once seated in the plane, Allen looked out to all his friends as they cheered him on before his flight Wednesday morning at the Delaware Municipal Airport. As Charles Allen walked into the hangar at the Delaware Municipal Airport on Wednesday, he was greeted by the Willow Brook at Delaware Run ground crew. Allen was surprised to see all of his friends from Willow Brook who came to watch the historic flight. The last time Charles Allen, left, had control of an airplane was 1969, just before he retired from the U.S. Air Force. Allen, now 100 years old, had control of a Cessna 172 airplane from the moment of takeoff to the moment the wheels touched down. Allen’s co-pilot in the adventure is Chris Ward, right, a 23-year-old flight instructor with Spencer Aviation housed at the Delaware Municipal Airport. Ward said after Allen landed the plane that he would be Allen’s co-pilot anytime. 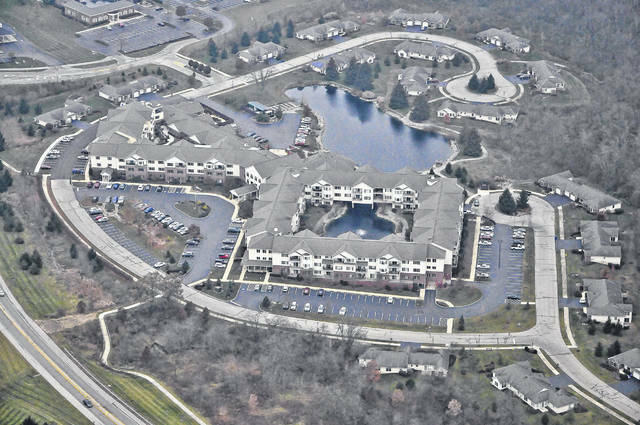 After takeoff, Allen spotted and circled the Willow Brook at Delaware Run campus located on Delaware’s west side. Allen has called the retirement community home since 2012. 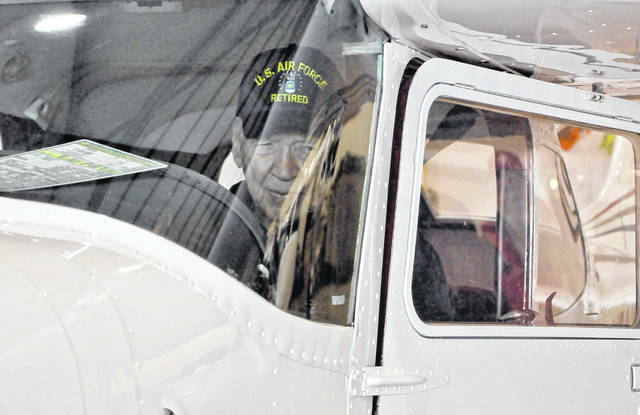 After climbing into the pilot’s seat, World War II and Vietnam War veteran Charles Allen buckles up and looks over the controls of the plane. Allen said he had never flown a civilian aircraft before, but he looked forward to taking control of the Cessna 172. 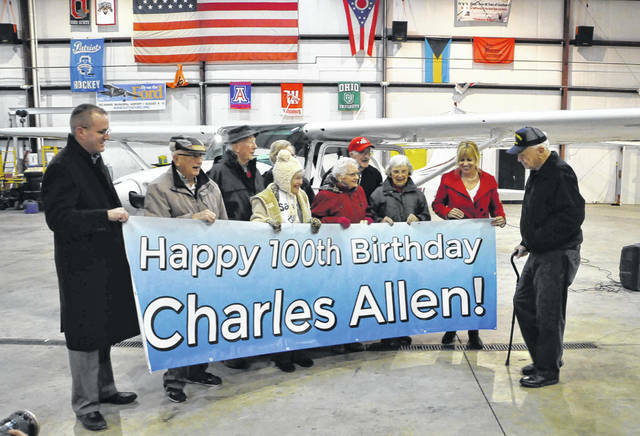 It was Allen’s 100th birthday wish to fly and land a plane one more time. Allen, a World War II and Vietnam War bomber pilot who logged 6,500 hours of flight time during his military career, had one wish for his 100th birthday — take off and land an airplane one last time. He said the last time he flew a plane was during the Vietnam War in the late 1960s. Allen flew for the U.S. Air Force from 1941 to 1971. He flew over a dozen combat missions in both WWII and the Vietnam War. He is a recipient of the Purple Heart, the Distinguished Flying Cross, a Bronze Star and two Air Medals. Allen, who retired as a lieutenant colonel, resides in Delaware at Willow Brook at Delaware Run. 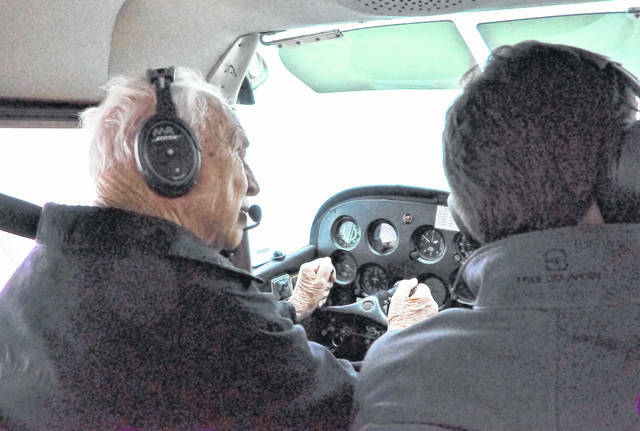 Despite being retired from the Air Force for 47 years, Allen kept looking toward the sky with the goal of flying a plane on his 100th birthday. “I wanted to see if I could still do it,” he said about flying a plane again from takeoff to landing. Mark Spencer had heard about Allen’s birthday wish and thought it was a great idea. Spencer is the owner of Spencer Aviation, a flying school located a the Delaware Municipal Airport. “We thought it would be a great idea to help set up that flight for him,” he said. Spencer set the flight up with Chris Ward, a 23-year-old flight instructor who received his pilot license at the age of 17. Ward said he has always had a love for flying since his first flight as a toddler. Ward made note that he is the same age as Allen when he was flying bombers for the Army Air Corps in WWII. As Allen entered the hangar on Wednesday morning, he was greeted by his very own Willow Brook ground crew of about 40 people who came to cheer him on. Once aboard the plane in the pilot seat, Allen looked over the control panel in front of him, taking note of all the instruments. Sitting in the co-pilot seat next to Allen, Ward walked him through the preflight checklist before starting the plane. Once the list was completed, Ward yelled “clear” to the ground crew, who clapped with enthusiasm as the engine roared to life. Ward taxied the plane to the end of the runway, gave Allen some last-minute instructions, brought the engine up to full speed and then indicated to Allen to take the controls. Allen guided the plane down the runway into the air, climbing to 2,000 feet out over Delaware. He smoothly negotiated turns and corrected for turbulence as if he had just flown yesterday. At one point during the flight, Ward held his hands in the air to show that Allen had total control of the plane. During the 30-minute flight, Allen circled over Willow Brook on the city’s west side and the Delaware County Fairgrounds, flying back along the north end of Delaware to the airport. Before landing, he flew just above the runway to get a feel for the plane as it descended to land before climbing again to make his final approach. Once lined up with the runway again, Allen reduced engine power, letting the plane glide to the runway to a perfect landing. “As an instructor, I would give him an A-plus,” Ward added. This entry was tagged Charles Allen, Chris Ward, D. Anthony Botkin, Delaware Municipal Airport, Spencer Aviation, Willow Brook at Delaware Run. Bookmark the permalink.